At a time when technology is rapidly developing, delegates at timeshare industry conference RDO7 heard that businesses must face the challenge of constantly keeping up to date in order to engage their customers. The same can be said for the timeshare industry – choosing a social media platform to focus on or deciding whether to invest in an app for example is a difficult decision when we cannot predict how technology will advance in the coming years. Gareth Dunlop, CEO and founder of user experience specialist agency Fathom, delivered an insightful presentation to delegates, explaining that we don’t necessarily need to be ahead of the game, we need to understand it to become a key player. Using the example of his rugby hero Paul O’Connell, Dunlop shared the importance of leadership in order to get off the back foot and onto the front foot online. As the attacking team gains momentum, it is crucial players know what they are doing and the roles they play – just as O’Connell did in order to compete with the opponent and lead his team to victory. Dunlop related this to our industry. The digital winners aren’t always the savviest nor do they use the most advanced technology – but they do have a clear understanding of the roles they need to deliver on. With this in mind, the digital winners are those who are consistent in their communication with their customers, using the same voice for social media, call centres and websites, to ensure their customers feel they are dealing with one brand. 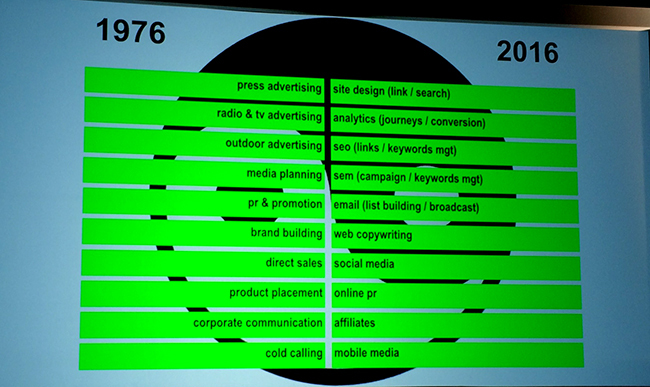 Dunlop shared an insightful comparison of 1976 and 2016 to demonstrate how marketing roles have transformed during the last 40 years. Dunlop went on to explain that every single person using the web or a digital product is on a journey. If that journey is interrupted, such as when a website doesn’t load, only 50 per cent of users will return to try it a second time. Spending time and money on the user experience is therefore much more rewarding than investing in new products if your online channels aren’t equipped to support your communication. Technology has transformed marketing in leaps and bounds and often many businesses lose sight of how they communicate with users and consequently lose the voice of their brand. Dunlop said businesses need to make the voice of the brand a priority once again and keep customers on a journey that will entice and engage with them. The beauty of the digital world is that we have the ability to communicate with one voice, but in reality the absence of face-to-face conversations means we can become lazy and make assumptions. The role of the Media Manager has never been more complex. No longer can we railroad customers with advertisements, we have to be strategic and tactful in the way that we can communicate with users. As the online world continues to expand, the web is becoming more personal and is effectively ‘shrinking’. Online users are visiting fewer and fewer websites each week; they subscribe to the emails they want to read and they have a small number of apps on their home screen they use on a regular basis. Own our way in – encouraging users to leave the comfort of their digital wall garden and come willingly to your business to seek products and content. The third option is of course the most effective as it demonstrates that the user recognises the value of your communications. Businesses that achieve this access have the most effective and successful campaigns as their users are active, engaged and most importantly, interested in their messages. Dunlop went onto share some knowledge on how businesses are performing. A recent study showed that customers are prepared to spend $12 billion to remove online advertising – the equivalent to turning the lights off on Times Square. Many businesses are failing to make a conscious effort on how their business is presented online and are not investing to improve their digital voice, footprint or shadow. However, some companies are operating a successful online strategy. During the first year of Amazon’s trading, Jeff Bezos invested 100 times more into the customer experience than advertising and the results speak for themselves. Google’s strategy is also centred on the user experience as it understands the role of reputation online, ranking businesses according to customer engagement and satisfaction. In closing, Dunlop encouraged delegates to stay away from ‘shiny new products’ and follow those companies that have scaled down their approach, focusing on the user’s journey in a bid to maintain an excellent brand reputation.